Pancho Barnes was a force of nature, a woman who lived a big, messy, colorful, unconventional life. She ran through three fortunes, four husbands, and countless lovers. She outflew Amelia Earhart, outsmarted Howard Hughes, outdrank the Mexican Army, and out- maneuvered the U.S. government. In The Happy Bottom Riding Club, award-winning author Lauren Kessler tells the story of a high-spirited, headstrong woman who was proud of her successes, unabashed by her failures, and the architect of her own legend. Florence "Pancho" Barnes was a California heiress who inherited a love of flying from her grandfather, a pioneer balloonist in the Civil War. Faced with a future of domesticity and upper-crust pretensions, she ran away from her responsibilities as wife and mother to create her own life. She cruised South America. She trekked through Mexico astride a burro. She hitchhiked halfway across the United States. Then, in the late 1920s, she took to the skies, one of a handful of female pilots. She was a barnstormer, a racer, a cross-country flier, and a Hollywood stunt pilot. She was, for a time, "the fastest woman on earth," flying the fastest civilian airplane in the world. She was an intimate of movie stars, a script doctor for the great director Erich von Stroheim, and, later in life, a drinking buddy of the supersonic jet jockey Chuck Yeager. She ran a wild and wildly successful desert watering hole known as the Happy Bottom Riding Club, the raucous bar and grill depicted in The Right Stuff. In The Happy Bottom Riding Club, Lauren Kessler presents a portrait, both authoritative and affectionate, of a woman who didn't play by women's rules, a woman of large appetites--emotional, financial, and sexual--who called herself "the greatest conversation piece that ever existed." Lauren Kessler is the author of nine books, among them Stubborn Twig, which received the Frances Fuller Victor Award for the year's best work of literary nonfiction. She directs the grad-uate program in literary nonfiction at the University of Oregon in Eugene, where she lives with her husband and three children. 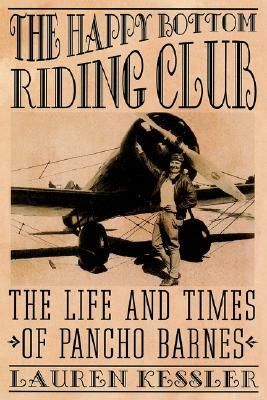 "The hard-drinking, sexually promiscuous pilot and adventuress Florence 'Pancho' Barnes exploded every feminine stereotype on the books. Thank you, Lauren Kessler, for telling her story with the grace and exuberance it deserves." "Pancho Barnes is an unsung American eccentric who helped keep the 'wild' in Wild West. With tremendous zest, insight, and intelligence, Lauren Kessler has given us a compelling tale of a great woman who wasn't afraid to make life synonymous with risk."